Create a zen like ambiance in your outdoor space with our Round Concrete Fire Pit, its shape and size and concrete exterior make it a perfect fit for many spaces. The round shape just begs for a circle of relaxing chairs, especially our classic Adirondack Chairs. Fire Pits make exceptional focal points for outdoor living spaces. Not only do they offer warmth on cooler nights, they also add a lovely ambiance that everyone will enjoy. 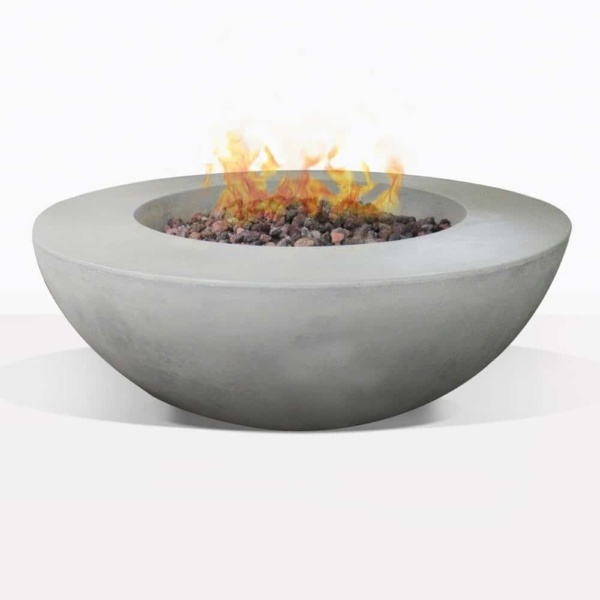 Our gas concrete fire pits are expertly designed and constructed. The provide ample heat to your relaxing area. They are easy to use and you have two options for the gas supply. They are able to hook up to your gas line with the help of a professional gas fitter, or they can be connected to a refillable propane tank. It is important to use and maintain your fire pits properly. Call us today to learn more, or visit our showroom to experience how wonderful they are!